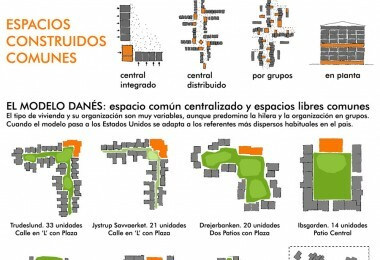 El aspecto más interesante de este cohousing para profesionales es la integración cooperativa de la vivienda con los espacios de trabajo y de producción. El ciclo del agua y el de los residuos están integrados con la producción de alimentos en huertos localizados en terrazas que sirven para el suministro del restaurante y la escuela de cocina situados en la planta baja y que son propiedad y lugar de trabajo de la cooperativa de residentes. Es el resultado de la colaboración entre el Ayuntamiento, el sindicato de trabajadores de la hostelería UNITE HERE y la Agencia de Vivienda de Toronto. Forma parte de la estrategia de revitalización social de la zona de Regent Park, en el centro de Toronto. como cooperativa buscando una forma rentable de construir y mantener el proyecto. Para ello ha sido clave la incorporación de un restaurante, una escuela de cocina y espacios sociales dedicados a la alimentación y su producción. El resultado es un ecosistema de ciclo completo que en la pequeña escala se ha descrito como “la permacultura urbana”. El restaurante y la escuela de cocina, situados en planta baja, son propiedad de los residentes que también los gestionan y trabajan en ellos. Los huertos en las terrazas de las plantas altas suministran verduras, hierbas y frutas que se utilizarán en ambos lugares. Los huertos están regados por las aguas pluviales recogidas en los tejados y los residuos orgánicos generados por la cocina sirven como abono para el jardín. El proyecto explora las posibilidades de la organización de la vida en común, manifestada tanto a nivel de relaciones sociales y de los espacios comunes como a nivel productivo. Este proyecto cuenta con la certificación LEED y ha recibido varios premios de sostenibilidad y diseño urbano. Toronto’s first housing co-operative in 20 years, 60 Richmond East is an urban in-fill project that incorporates a dynamic building program and LEED initiatives. Interlocking and contrasting volumes and voids create a sculptural and spatial composition that animates the streetscape. The building is home to hospitality-industry workers and their families who were displaced due to the redevelopment of Regent Park – one of the city’s largest social housing renewal projects. 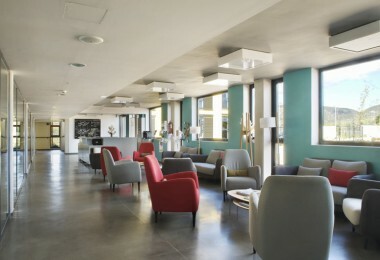 A resident-run restaurant and training kitchen provide supplementary income and additional experience for the residents, and a community garden on the sixth floor terrace provides food for the restaurant and uses the organic waste generated by the kitchen as compost. Rainwater is used for garden irrigation. These elements create a self-sustaining condition of ‘urban permaculture’. One of Teeple Architects’ latest projects, 60 Richmond East Housing Co-operative, was completed in March of 2010. This 11-story, 85-unit mixed use building is among the first new housing co-ops to be built in Toronto in recent years. 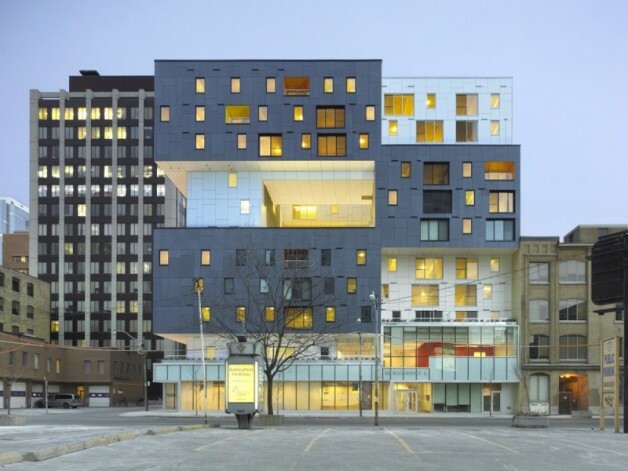 It won the Ontario Association of Architects Design Excellence Award (2010) and the Canadian Architect Award of Excellence (2007). 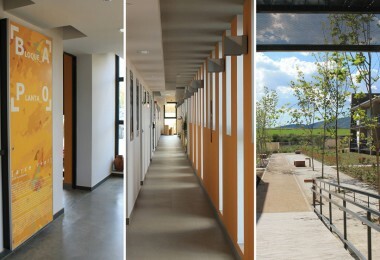 It has achieved LEED Gold certification for environmental stewardship. The project results from collaboration between the local city councilor, the hospitality workers’ union ‘UNITE HERE’, and Toronto Community Housing. Many of the tenants are being relocated here as part of the revitalization of the Regent Park social housing project. The new residents are primarily employed in the hospitality and restaurant industry. The client program – a housing co-op for hospitality workers that would be economical to build and maintain – was a key inspiration for the design which incorporates social spaces dedicated to food and its production. The result is a small-scale, but nevertheless full-cycle ecosystem described as “urban permaculture”; the resident-owned and operated restaurant and training kitchen on the ground floor is supplied with vegetables, fruit and herbs grown on the sixth floor terrace. The kitchen garden is irrigated by storm water from the roofs. Organic waste generated by the kitchens serves as compost for the garden. Unlike the myriad of condominiums that populate the downtown landscape, 60 Richmond was conceived a solid mass that was carved-into to create openings and terraces at various levels. The deconstructed volume creates interlocking and contrasting spaces stepping out and back from the street. This visually dynamic solution was instrumental in achieving several key objectives: Creating the kitchen garden, drawing light into the building interior and providing outdoor green space. The garden terraces created in this process also help cool and cleanse the air thus limiting heat island effect in the urban core. 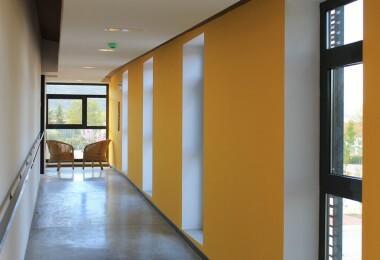 The client’s requirement for low maintenance costs also inspired many of the design and sustainable innovations. Durable materials were combined with energy saving strategies such as insulating fibre cement panel cladding, high performance windows, a sophisticated mechanical system, heat recovery, as well as drain water heat recovery from the common laundry facilities. A reduced carbon footprint is further achieved with a low maintenance green roof and rainwater collection for the terrace gardens. With 60 Richmond, Teeple Architects sought to create an innovative, sculptural and spatial composition in a manner that defines and animates a dynamic public realm. The result is a building that wraps around its corner site while it is simultaneously perforated by a courtyard that reaches outward to the street, connecting this semi-public outdoor amenity space to the public space of the city. This solution creates outdoor amenity spaces including the 6th floor garden and also provides daylighting to both residential units and hall ways. With the design of 60 Richmond, Teeple Architects has created a dynamic urban form that brings a green environment into the city without dismantling the urban form. This project demonstrates the firm’s dedication to creating a dynamic and inventive urbanism where sustainable design considerations are integrated into the conception of the project. It is also an example of ‘urban permaculture’ and an exploration of the potential of the co-op as a social organization appropriate for the provision of affordable housing. hola ricardo me gusta mucho lo ke haces tiene ya un buen tiempo que recibo tus boletines y la verdad me gustan mucho, yme han ayudado en mi vida diaria muchas felicidades y gracias.